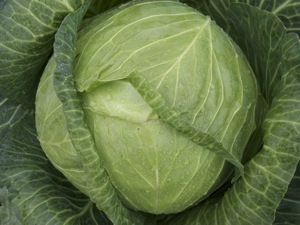 Storage: Fresh whole cabbage will keep in the refrigerator for one to six weeks depending on type and variety. Hard green, white or red cabbages will keep the longest while the looser Savoy and Chinese varieties should be used more quickly. Keep the outer leaves and do not wash before storing since moisture will hasten decay. Preparation: Remove the thick fibrous outer leaves and cut the cabbage into pieces and then wash under running water. Taste: Pungent, earthy, slightly sweet. Nutritional Benefits: Cabbage provides fiber, vitamins A (supports eye health and prevents the creation of cancerous cells), C (promotes immunity) and K (for blood and bone health). It is also a source of folate (helps the body produce energy), potassium (helps nerves and muscles communicate; also helps move nutrients into cells and waste products out of cell), and manganese (benefit to healthy bone structure, bone metabolism, and helping to create essential enzymes for building bones).